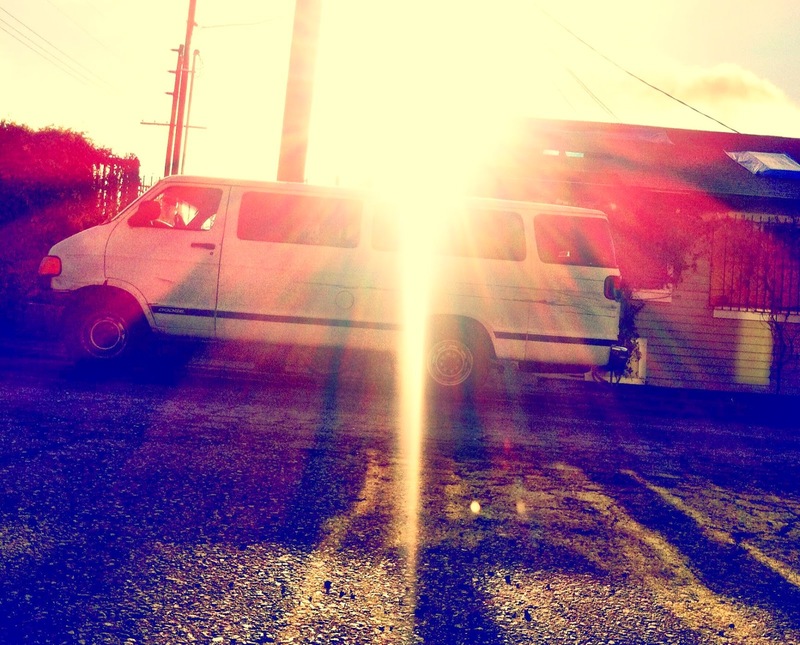 Ol' Bessie, The Van, my girl. I just got her out of the shop. So I took her out tonight. I ran her through her paces. She did good. She did real good. We went out, just me & her. Up through the Sepulveda Pass to the 101 North. Lilted and lurched through a bit of traffic. Then smooth sailing. I wanted to really test her out. Get her ready for the boys this weekend through to the busier Summer travel months. So I took her up in to the canyons and hills of Malibu. We were flyin'. She was ridin' smooth as ever. Like a dream. Up Kanan Road. Riding like the wind. & not even until we're on the way down does the same warning light turn on that's been coming on for 4 months on & off through countless phone calls, trips to the mechanic and thousands of dollars later. I turn the music off. And I smell the heat coming off her. Real bad. So I put her in neutral the rest of the way down the hill. Headed South on PCH goin' 35MPH. 20 below the limit. Cops, Ferrari's & drunks passing by with no bother. Even though she was running real hot, I pushed to her limit out to our old favorite spot right on the beach there in Malibu. I could hear the waves crashing. I had a couple tacos stowed away in case we got stuck. So I cozied up inside her and we had a little picnic. And finally I look up and I see the most surreal enormous gorgeous moon just barely rising up over the city and dancing intricate choreography on the ocean. Glowing a big luscious orange until settling on a sublime yellow. And we enjoy our tacos, me & Ol' Bess. Relishing the moment. She's cooled down by now so I drive us straight to the mechanic & leave 'em a note to take good care of her. And lemme know if we can salvage her. As I'm waiting at the mechanic for the cab to come, a bum on her bike is riding in circles around us. She asks me if I have any money. And I said no. And then she asked if I was in that movie. And I said what movie. Then I looked down the street and saw there was a big movie filming. And I said no. But she didn't believe me. And she said what's your name? And I said paul. And she said paul what? And I said Paul Iamnotfamous. And she laughed and said I like that Paul. It's nice to meet you. And I said nice to meet you too, what's your name. And she said Delicious-- Delicious Iwish. And we stood there and laughed and we bumped fists. And then she rode her bike around in more circles. I hugged ole Bessie girl I once knew and am hoping for the best for her tomorrow. Ol' Bessie, Delicious Iwish and all of us.